28th January and it’s the first race of the 2018 Onza Mini Downhill series at the Forest of Dean. This was my first race after moving to Team Flow and my first race in the masters category, instead of seniors. The track is announced the Thursday before the race; this round was ‘Flatlands into Sheepskull’. I’ve never raced Flatlands before and only ridden down it once, so I didn’t really know what to expect. Unfortunately I had a work course all day on Saturday so missed practice day, but managed to squeeze in an hour of checking out the track on the Friday evening after work. Friday was great, I was really pleased I had chosen to ride my enduro over the downhill bike as the track has quite a few pedally sections. The track seemed to be running fast and Flatlands is a great alternative start to Sheepskull, I was happy with my lines and I went home excited for racing Sunday. It rained a lot between Friday night and Sunday morning and the track had changed a lot! Flatlands to Sheepskull is made up of a few flat pedally sections and flat corners, a few patches of exposed roots, a couple of faster chutes, particularly on to and off the fire road, and towards the bottom some tight corners and a few jumps. I arrived early to make sure I was ready to go as practice began at 9am. I set off confident and with the pace I had been riding on Friday. As I got to the roots (an old nemesis of mine that I had considered conquered) I stuck to my normal line, one I have done countless times, but it took me by surprise as I found myself on the floor after I slid out and ended up going down pretty hard on the roots. I picked myself up and headed to the top to try again, and the same thing happened. The roots were covered in mud and mega slippy, I wasn’t alone, and a lot of people were struggling. I refused to give up and I tweaked my line and got through a few times so I was happy I could ride it, but also had another two crashes in practice, sliding out on other greasy roots so I felt quite battered and bruised by the time practice finished. The turnout of 44 women was astounding and it was great being stood at the top with so many women, from experienced world cup athletes to ladies doing their first races. First runs were interesting for a lot of people as there were lots of new female faces so we didn’t seed ourselves like we have done previously. A lot of riders caught each other up but everyone seemed to be buzzing and everyone was in one piece. After all my crashes in practice I decided to take it steady and make sure I got a clean run in, which I did, putting me in 3rd after the first runs. I was really pleased; after coming 4th in nearly every race last season and always just missing out on a podium, a 3rd place finish was the boost I needed. Unfortunately second run didn’t go so well, I knew I needed to go a bit quicker than my first run so I pushed a bit harder but it didn’t pay off! A sneaky slippy root on the lower half of the track had me take a big crash and I struggled to get back on the bike and clipped in again. So I fell in to 4th place for the finish. Always a bit gutting to crash on a race run, especially when I was so close to the podium, at least my new kit from Flow MTB kept me looking good even when I couldn’t stay on the bike. 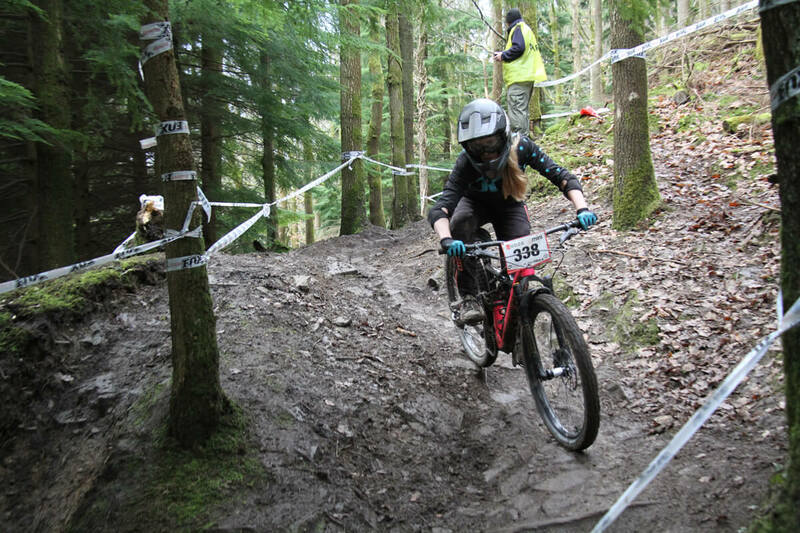 A frustrating and disappointing result for me, but the Mini Downhill races are great events and it’s brilliant to see so many women starting racing here, just like I did 2 years ago.